One purpose of the entire Kalachakra Initiation is to turn the wheel of time, to accelerate our encounter with our own karma. Because the wheel is also symbolic of timeless bliss, we are also presented, as is the intention of all tantric practice, with an immanent opportunity to realize the nature of reality. And since none of us is truly separate from anyone or anything else, turning the wheel of time accelerates everyone’s encounter with karma. Over four days, through a long series of ritual steps, we are “blessed into magnificence,” initiated into the “lineage of the buddhas.” We are given an opportunity to embody the altruistic mind of enlightenment in a relative sense, as well as to be invited into an ultimate realization of the true nature of mind and the essence nature of all phenomena. We make vows. We enter purification procedures of body, speech and mind. We pledge to adhere to standards of behavior. We dedicate ourselves to selfless acts, building capacity to generate bodhicitta, realising the absence of any inherent reality of self and other, the indivisibility of all things, so that our actions in the world strike at a deeper, universal level. The field has been prepared and blessed. After five days the mandala has been completed. The lamas have made all the necessary prayers. We have been instructed and are now being led through the preliminary resolutions. Initiation is being invited to join the host of beings who themselves rose to accomplishment through their practice and dedicated themselves to service. We sit practically knee to knee on every possible construction of cushions, foam pads, plastic mats, and a smattering of lawn chairs. 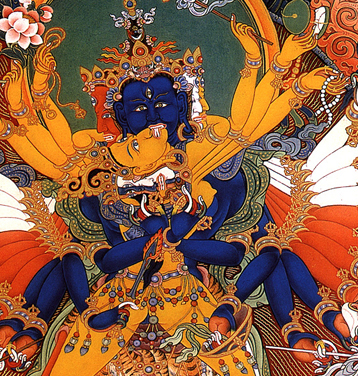 Everyone here, from nearly every corner of the planet, takes the vows and receives the blessings with whatever certainty they can muster, entering the exquisite complexity of the mandala, its three levels, its 722 deities, assuming an operational as well as an aspirational commitment to elevate their game. We listen in silence, following the ritual until we receive instructions. Then, like a cloud of starlings blotting out the sky, as if collectively solving some complex equation, we rise in a coordinated human murmuration of consciousness to the call from the Dalai Lama to orient our inner space, to form the requisite intentions, to assume the responsibilities of the vows, to adjust the vector of our personal course. This is a step into the heart of activism, grounded in tantric practice. Initiation is like planting a seed of potential in the mind. It is not empowerment. We are not suddenly more powerful than yesterday. Empowerment is a challenge. Nothing is guaranteed. Initially, everything is pure potential….and nothing but. If potential is combined with clarity and honest intent, perseverance, then it may blossom into material change. In general, the tantric path is also about repetition. Through repeated meditative projection of certain desirable qualities followed by the dissolution of those qualities back into ourselves, we reinforce our personal capacities. It is through repetition that single-pointed awareness can develop. It is through repetition that one gradually awakens to the full meaning of the practices, extending into the broken heart of the world, the deeper reaches of the mind, to awaken shamanic capacity. Repetition is the long game. This is Buddhist neuroscience. 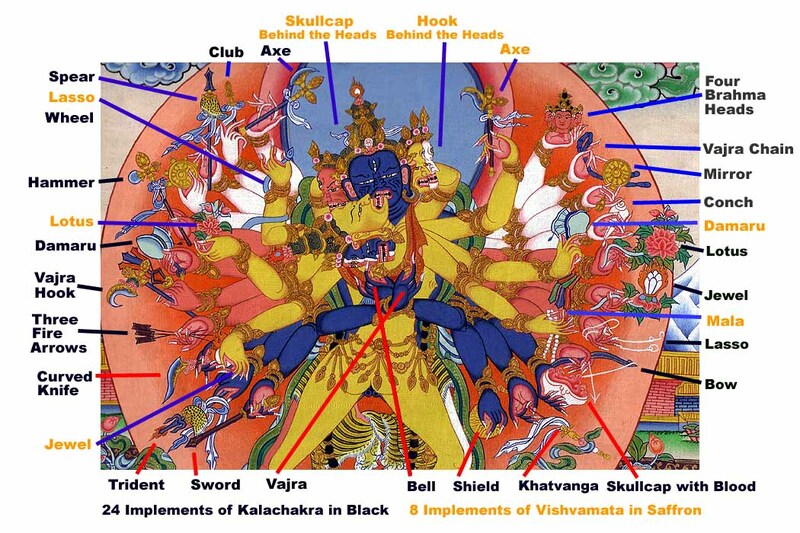 Why is Kalachakra so popular? I guess anything the Dalai Lama does is popular. This is his 34th Kalachakra. The material is second nature to him. He commands the process with unsurpassed facility, clarity and skill with an obvious command of the great compendium of Buddhist literature. This is not elementary stuff. How many people has he guided into the Highest Yoga Tantra in thirty-four years? This alone would be an enormous gift. But then, his entire life has been a gift. When one contemplates inspiring several million people over several decades through this ceremony to develop highly refined altruistic intention and capacities, one may get the flavor of the scale of benefit he is personally imparting. But there are surely other reasons why so many have appeared. We do not attend merely for ourselves, nor is the ceremony only for the attendees. It is for everyone. It is a declaration of unity, of Oneness. It is a call for the peace and compassion that arise from dismantling of the machinery of aggression, hatred, greed and unrestrained desire within the human heart. All of this enlarges the operational view into a four-dimensional perspective whose source is the four-dimensional structure of the mandala itself, the spiritual home and creation of the Kalachakra deity, who is both a Form Body and also infinite spaciousness. Absorbed in perpetual union with his consort Vishvamata, theirs is the dynamic and sublime mutual accomplishment of dissolving the barriers between arising and passing, being and doing, between vowels and consonants, between past and future, melting into the eternal unchanging blissfully awakened union of method and wisdom. 1. For 45, there is no such thing as personal development, no spiritual journey, no such idea as an awakening, nothing beneath the surface of things. 2. We hold ourselves to standards of ethics, morality, in a continuous evolution toward pure intent. 45 serves no one and nothing other than himself. He takes no vows, holds himself to no standard other than getting what he wants. 3. 45 is the ultimate materialist. He is not dedicated to the union of things, nor to any mutual recognition of our inherently common nature. 4. All things exist inherently for exploitation. 5. The mandala of 45 is populated by men and women of common mind, hungry ghosts who imagine themselves as deities already in common service to racketeering and corruption. That’s why they were chosen. 6. Instead of being absorbed in magnificent blissful perpetual union with a feminine peer, symbolising the indivisibility of all things, 45 rejoices in denial and subjugation of the feminine. In India, our entry into the Kalachakra mandala was a matter of choice. But on this day, we sense doom as we have all been pulled unwillingly into the sphere of 45. We fear for ourselves, for the whole, and most for those who are least able to speak, which is why we dedicate ourselves to serve the whole, to render no one as enemy, to be disciplined, joyous, persevering and clear of heart, prepared to raise our voices with unshakeable commitment to what we know is true. This entry was posted in Buddhism, India, Personal, Travel and tagged Bodhgaya, consort practice, Dalai Lama, Highest Yoga Tantra, Kalachakra deity, Kalachakra Initiation 2017, kalachakra tantra, tantric yoga, turning the wheel of time, Vishvamata by garyhorvitz. Bookmark the permalink. Gary, if that is still your name, you are like my personal Dalai Lama, lifting me up and showing me another way. I could never do what you are doing, nor fly to the moon unaided by Elon Musk, but I so respect what you have done for yourself and to show us a path that is ancient and yet prepared for us to follow, instead of following 45 to certain destruction. Keep on the path and don’t forget to come home. We need you here.